Love is Everywhere: November Sponsor Offer! Hello everyone and welcome to this beautiful Fall Day! I hope you're enjoying this weather as much as I am. 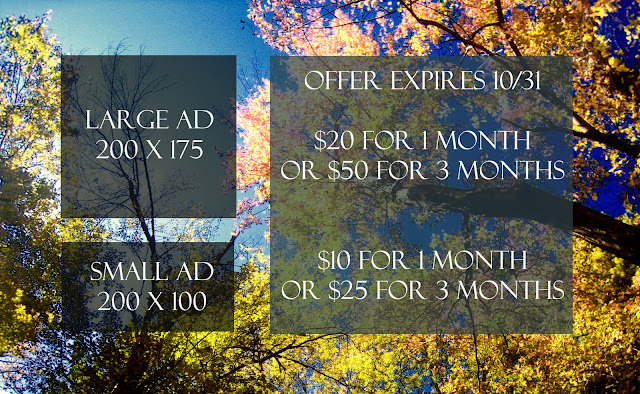 I'm excited to announce a huge offer for Sponsoring that will expire 10/31. All that's normally included for the Large or Small ad still remains and you can view the details under Sponsor. If you would like to be a Sponsor at Love is Everywhere and partake in this offer, please send me an e-mail at LoveWithKatie@gmail.com. Love you all and thank you for the continued support!